Order your Latin Percussion Stealth Jam Block from AMS and enjoy Fast & Free Shipping. Get the Best Deal with our Lowest Price Guarantee & Great Customer Service! The Latin Percussion LP1208K Stealth Block is made from high-quality Jenigor, LP's exclusive plastic formulation. Don't be fooled by cheap imitations, not all blocks are created equally. Awesome. Just awesome. Sounds a lot like the red jam block...but black. Comes with the black hardware for a really nice blend in my kit. A bit pricey, but worth it. Stealth Jam Block is Awesome! This thing is indestructible, and when I tighten everything, it will not budge, no matter how hard I play. It looks awesome, sounds awesome, and will last me forever. The one down side is that it was a little pricey, but I guess I was paying for the high quality. Sounds like a real wood block, but I can make it project even more, since I don't have to worry about it breaking. I love every aspect of it. There is no downside. It is a superior product, but it was a little expensive in my opinion. Knock $5-10 off the price and the value would be tremendous. Looks awesome! Doesn't stick out like those red and blue jam blocks. It's sleek and cool. Very good quality, durable, and able to withstand any style player's hit. The black color makes this equipment stylish and does not stand out. 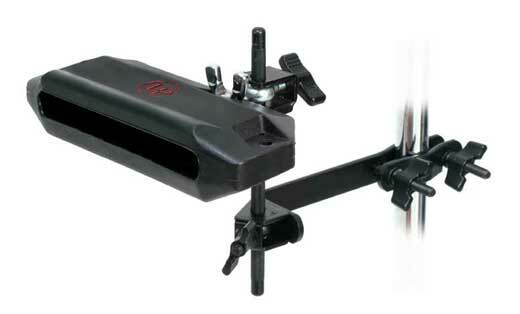 This product is very easy to mount and the bracket makes it easy to mount other places on your kit. This product is well worth the money. The sound quality of this product is very good. The sound really echoes out when played.